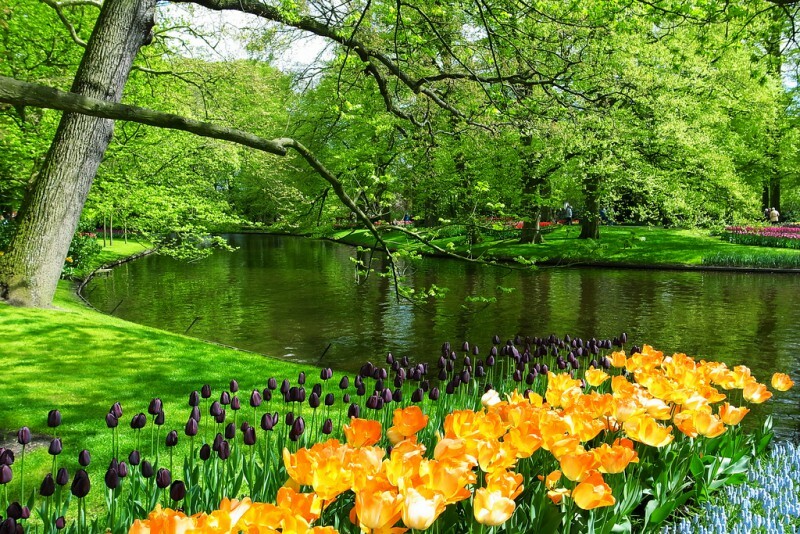 The Netherlands is commonly associated with the colourful beauty of tulips and, ever since they were first planted in the country back in 1593, they have captivated the hearts of many. The Netherlands Flower Route scenic drive is a fantastic scenic drive that spans over a distance of about 40km. This makes it a popular drive and it is also quite common to see cyclists along this road. Over the weekends, the roads tend to get fairly busy with many visitors but they are pleasantly quiet in the week. The drive can quite easily be done in less than an hour but, if you really wish to enjoy everything it has to offer, it is best to take your time. It is also essential that you time your visit perfectly for the spring so that you can enjoy these fantastic flowers in full bloom. Of course, it’s not just tulips that you will get to enjoy but also daffodils, narcissi, and hyacinths. You really can make an extended road trip out of this drive and, if you fancy the freedom of not having to book into hotels or other accommodation, a RV, campervan hire or motorhome rental will provide the best of both worlds – transport and a place to sleep and eat! Your drive might begin in Haarlem but, since it is so close to Amsterdam, you could quite easily spend some time in this vibrant city before your drive or upon your return. The historic centre of Haarlem is known for its landmarks and canals that have been regular featured in various works of art.The Frans Hals Museum in Haarlem is a popular stop for tourists as this gives you a better understanding of the local history, art and culture. There are a number of fine landscape paintings housed here and they will provide you with an even great appreciation for your surroundings. From Haarlem, you will make your way to Lisse. The main attraction here is the Keukenhof Garden which was once a simple kitchen garden belonging to a 15th century countess. It is now one of the most beautiful spring gardens in the entire world! It spans over 70 acres and each year receives over 700.000 visitors. There are 14km of walking paths which make it ideal for a short or long stroll. Some attractions in the garden include a windmill, ponds and greenhouse pavilions which are home to indoor displays. The best time to visit is between the end of March and the middle of May. Castle Keukenhof is another top site and is located directly opposite the garden. It was constructed by a former commander of the VOC (or Dutch East India Company) which played a vital role in the local economic success. Next you will continue driving on towards the finishing point in Naaldwijk. Here you will gain a real understanding of the massive impact of the flower industry and the vital role it plays in the country’s economy. The largest Dutch flower auctions raise almost $5 billion and Naaldwijk is located in the middle of the Westland which is the largest greenhouse area in the world. You can enjoy a tour of the Naaldwijk flower auction house and, although you cannot personally participate, you can still learn more about these auctions and get a feel for the vibrant atmosphere. Although Naaldwijk is the end of the line, there’s no reason not to spend a day or two here in your Motorhome Rental or Campervan hire before making your way back home. Alternatively, if you didn’t have time to explore Amsterdam before your drive, you can travel back and spend some time there instead.